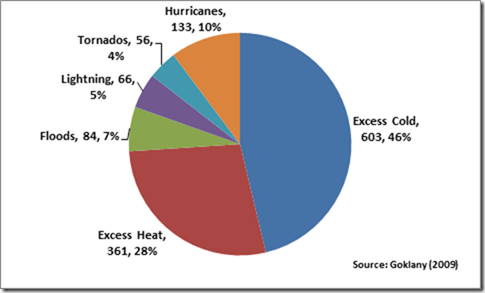 Hurricane Fatalities, 1900–2010: Context in these Stormy Times | Watts Up With That? Despite the press given to hurricanes on the dangers they pose to life and limb, in the larger scheme of things, their contribution to U.S. mortality (less than 0.01% on average each year) verges on the trivial. More importantly, death rates are substantially lower today than they were in decades past. In the following, I am assuming that the catastrophic failure of the levees after Hurricane Katrina should be attributed to hurricanes in general, rather than human failure–a questionable assumption. Also, I am assuming 1,525 deaths from hurricanes in 2005 (see below). Figure 1 shows that 46% of all deaths from extreme weather events in the U.S. from 1993-2006 were from excessive cold, 28% from excessive heat, 10% from hurricanes 7% from floods, and 4% from tornadoes. Together they were responsible for an average of 1,301 deaths each year. To put these numbers in context, they constitute only 0.05% of the 2,367,000 deaths that occurred each year in the U.S., averaged over 1993-2006. Thus, hurricanes contribute, on average, about 0.006% to total U.S. mortality. Figure 1: Average annual deaths from extreme weather events, U.S., 1993–2006. 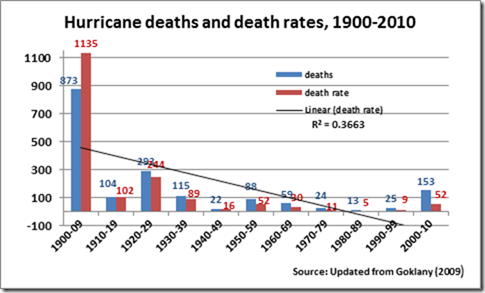 Long term U.S. data on hurricane fatalities show that from 1900–09 to the 2009–10, hurricane deaths and death rates declined by 82% and 95%, respectively (see Figure 2).These estimates use data from the National Hurricane Center (NHC) provided in Blake et al. (2007) which has 1,525 deaths for 2005, the year of Katrina. Figure 2: U.S. hurricane deaths and death rates per year, 1900–2010. Sources: Updated from Goklany (2009), using USBC (2011) and NWS (2011). For 2005, this figure uses National Hurricane Center data from Blake et al. (2007), which has 1,525 deaths for that year, but Blake et al. (2011) has 1,225 deaths while NWS Weather Fatalities uses 1,016 deaths. This figure uses the Blake et al.’s older data, pending consultation with Dr. Blake. Note that for the U.S., the cumulative average annual deaths from extreme weather events declined by 6% from 1979–1992 to 1993–2006, despite a 17% increase in population. On the other hand, all-cause deaths increased by 14% (Goklany 2009). That is, society is coping with weather related events better than it is for other more consequential health risks. This suggests that it is worth investigating whether public heath might not be better served if resources expended on limiting greenhouse gas emissions were, instead, used to reduce these more important health risks. If it’s warming, why are hurricane deaths and death rates going down? If temperatures are supposed to have increased both globally and in the U.S. and if, according to many warmists, warming should have—all else being equal—made hurricanes more destructive, why have deaths and death rates from such events actually declined over the long term? 4) Warming does not increase the frequency, duration or intensity of hurricanes and our adaptability has increased more rapidly. I tend to favor number 4. First, Atlantic hurricane frequency has not increased since the late 1800s despite any warming of sea surface temperatures (Vecchi and Knutson 2011). More significantly, as indicated by Dr. Ryan Maue’s estimates of global and Northern Hemisphere Accumulated Cyclone Energy (ACE) from 1971 to the present (July 31, 2011) indicate that they are close to their lowest levels since the late 1970s (see Figure 3) (Maue 2011, 2011a). Additionally, the global frequency of tropical cyclones is also close to its lowest levels in the past decades. These patterns are not consistent with claims that higher greenhouse gases will lead to higher temperatures which would increase the frequency and intensity of hurricanes. 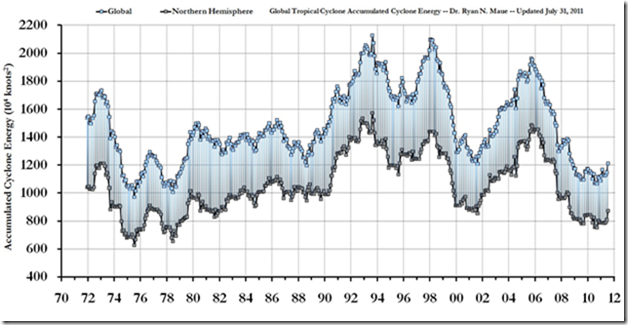 Figure 3: Global and Northern Hemisphere Accumulated Cyclone Energy: 24 month running sums through July 31, 2011. Note that the year indicated represents the value of ACE through the previous 24-months for the Northern Hemisphere (bottom line/gray boxes) and the entire global (top line/blue boxes). The area in between represents the Southern Hemisphere total ACE. Source: Maue, R (2011a), at http://coaps.fsu.edu/~maue/tropical/, visited 27 August 2011. Second, as articulated here, for a variety of reasons—many related to easy availability of cheap fossil fuels and improved forecasting capabilities—our ability to cope with disasters in general, and hurricanes in particular has gone up. Blake ES, Rappaport EN, Landsea CW. 2007. The Deadliest, Costliest, and Most Intense United States Hurricanes from 1851 to 2006 (and other Frequently Requested Hurricane Facts), Apr 15, 2007. 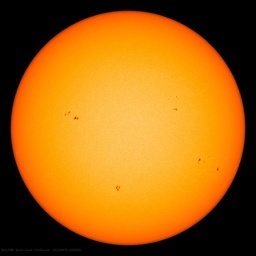 Available at www.nhc.noaa.gov/Deadliest_Costliest.shtml. Accessed Sep 26, 2009. Blake ES, Landsea CW, Gibney, E.J. 2011. The Deadliest, Costliest, and Most Intense United States Hurricanes from 1851 to 2010 (and other Frequently Requested Hurricane Facts), August, 2011. Available at http://www.nhc.noaa.gov/pdf/nws-nhc-6.pdf. Accessed 22 August, 2011. Goklany, IM. 2009. Deaths and Death Rates from Extreme Weather Events: 1900-2008. Journal of American Physicians and Surgeons 14: 102-09. Maue, RN. 2011. Recent historically low global tropical cyclone activity, Geophys. Res. Lett., 38, L14803, doi:10.1029/2011GL047711. Maue, Ryan N. 2011a. Global Tropical Cyclone Activity Update, visited 15 August 2011. NWS (2011). Weather Fatalities, visited 14 August 2011. U.S. Bureau of the Census. 2011. Statistical Abstract of the United States: 2011, visited 14 August 2011. Dr. Goklany, I appreciate your analysis, but you are completely missing the point of my paper(s). I do not support your contention in point 4. The historical record is simply too short and not accurate enough to determine if there is a global signal in tropical cyclone frequency, duration, and/or intensity due to global warming, YET. The natural variability associated with ENSO + PDO is so far trumping the very slow global ocean warming. I have never made the statement you are attributing to my paper. In other words, everything you cut-and-paste after your own work is NOT how I characterize my own research. Why not email me and ask before doing this? justify it with a computer model. Looking at figure 3, the very hot year 1998 also had a high ACE number, and the cold years of the late ’70s had low ACE numbers. 2009- 2011 have ACE numbers similar to the late seventies, and the US experienced similar extreme cold, snowy winters in 1977 and 2010. This makes me wonder whether the real temperatures were actually the same in 1977 and 2010, as opposed to the published numbers. Ex-Pat Alfie says: Methinks there is a touch of sarcasm in your post… no? Quite so. Any Team members listening and learning? I clicked the Weather Fatalities link provided in Dr. Goklany’s post and look at the 71 yrs PDF file. It showed a total of 3366 Heat Related Fatalities counting from 1986 to 2010, 673 Cold Related Fatalities, and 1035 Winter Related Fatalities. It doesn’t appear this supports the data in the Pie Graph. What is the cause of this apparent difference? I also question the attribution aspect in later years. If someone chokes on their dinner watching the “catastrophic” news reports of a “monster” storm, is it the storm’s fault? It seems to me that deaths due to storms used to be more directly related, i.e. from drowning or crushed by fallen structures, etc., whereas now, anything is fair game in order to help justify the over-the-top hysterical news reports, and even feed into the CAGW ideology. Interesting. In England, we don’t get much in the way hurricanes, floods, tornadoes, or heat waves, but our excess winter deaths are an order of magnitude greater than your annual weather -related deaths total – and from a much smaller population. And it doesn’t get that cold here, either. Before responding to your comment, let me say that I really like your work and the constant effort involved in keeping track of the ACE. That makes me doubly sorry for giving you heartburn. Regarding, point 4, although I did use your results to support why “I tend to favor number 4”, I don’t believe I implied that you supported my leanings on this matter. Regardless, I do apologize to you for not having further emphasized that my quoting your work in no way means you agree (or not) with point 4. I do agree with you that the record is not long enough to be definitive on whether warming increases (or not) the frequency, duration or intensity of hurricanes. That’s why I wrote, “I tend to favor number 4” rather “I favor number 4”. The fact that we cannot see a significant signal in the 4 decades worth of data regarding ACE (or longer, considering Vecchi and Knutson’s frequency info), suggests to me (at least) that effect is not significant or large (being swamped by natural variability). In light of this, I should have qualified my statement(s) to talk about “significant increases” or “large increases” rather than “increases”. So, for that, I do apologize. Either way, it suggests that the effect, if any, has not been significant or large (relative to other factors). From my policy analyst’s perspective, that is really the issue. Perhaps, if a tree falls in the forest and no one hears it, from the policy perspective it shouldn’t matter. So should it be with hurricanes and GW: If GW occurs, but has no signal in the hurricane data, then the connection shouldn’t matter (especially considering other things that do matter a lot). Regardless, thanks for your comments, and I hope I have clarified matters. Good question. I am not convinced of the veracity of the NWS data. I, and others, have been having issues with this for a long time. A brief summary of the reasons are written up in: Which is responsible for more U.S. deaths – Excessive Heat or Excessive Cold?. Also consult the Dixon et al. paper cited there. Over the years I have found discrepancies between data on the Weather Fatalities site (and its antecedents) and other sites, e.g., the Hydrologic Information Center data on floods, National Hurricane Center data on hurricanes (e.g., as noted in the above post for 2005: 1,016 in Weather Fatalities v 1225 or 1525 from Blake et al. ), tornado fatalities data from Brooks (Storm Prediction Center),and lightning data (Ashley and Gilson). A summary of these is in table 3 at http://www.jpands.org/vol14no4/goklany.pdf. I would like to see the numbers per storm. I can see, perhaps, how a changing world temp would spawn more or less huge weather events but once stable (ish) then why then? I dont buy AGW at all, I do believe that the printed books of the past are factual, and the MWP and the little ice age all existed, I dont think Londoners imagined the great ice fairs of victorian times, I know for a fact the thames did not freeze in the bad winters of the early 1960s. I dont believe the Vikings dreamed up farms on Greenland, and so on. These weather events seem to be a massive re distribution of heat energy in the oceans, you need a temperature gradient beyond a certain degree to form them, educated people not blinkered by the god of AGW seem to be able to predict them with a commendable accuracy (given the chaotic nature of nature) this, perhaps we need to record and remember. Im hoping that when the met offices give up on the false idols they now shape the forecasts to worship we can get back to some semblance of a forecast! Thank you for responding and the links. Now I have a bit of reading to do. 5) Warming does not increase the frequency, duration and intensity of hurricanes, and all else is not equal because our adaptability (i.e., adaptive capacity) has increased more rapidly. Since population growth has exploded, particularly along the coast lines, it is remarkable that fatalities have dropped as much as they have. Our technological progress of tracking storms has grown, and our ability to get out of harms way has saved many lives. Frankly, I lean towards my defined option 5. With Dr. Maue’s ACE index showing that an assumed warmer earth is not producing more hurricane energy, and the order of magnitude higher population than was present in the 1900s, seems to indicate a warmer earth does not necessarily produce more hurricane energy, and our adaptability has grown significantly. What’s being totally overlooked here is the fact that hurricanes also prevent many deaths. Those are deaths that would have occurred on the highways, but didn’t because the hurricane cleared the roads of traffic. Also those deaths resulting from out of doors activities, recreational and otherwise, that didn’t happen because those activities were not carried out. In fact, I believe that if one were to estimate the number of lives that would have been lost along the Eastern Seaboard had there been no Irene for the 3 days in question with the number that actually perished, you might very well find that Irene was a lifesaver, on balance. How about someone familiar with such data conducting such a research effort? Until the whole story is told, estimates of deaths from a hurricane cannot be taken seriously. Am I going to be the first to joke that the linear regression shows that hurricanes are now creating people? Beat me to it. According to Fig. 2, in the ’90s, the death rate reached -100, and surely is around -400 or more by now!